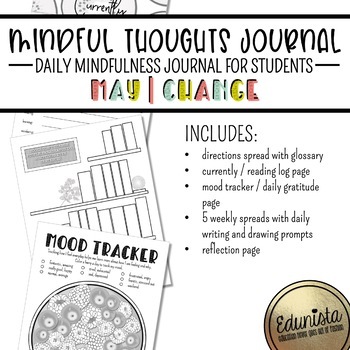 The Mindful Thoughts Journal is filled with daily mindfulness activities for students to help them develop a growth mindset. Each monthly journal focuses on a different character education concept and reflection to build social emotional-learning skill. May focuses on the topic of change. Students will think about different strategies for dealing with change. 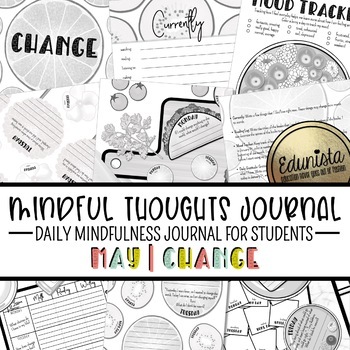 The Mindful Thoughts Journal is filled with mindfulness activities for students that are designed to be flexible and can be used in any month! The designs are centered around a fall theme and can be used whenever fall is for you whether that be around September, October, November or March, April, May, whatever that is for you. Each day students will be asked to reflect on the theme for this month, record their daily emotions, express a daily gratitude, track the books that they are reading, and stretch their creative muscles by sketching their response to a daily doodle prompt. 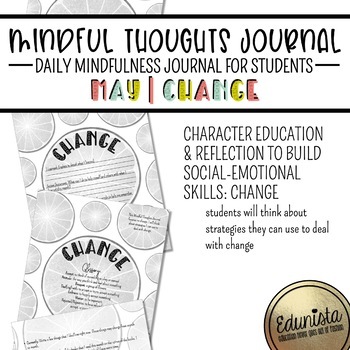 We created this journal to help students become more mindful of their thoughts and actions and how they can impact others. We hope that this journal will help your students as much as it has helped ours! We love using the Mindful Thoughts Journals as morning work. These mindfulness activities for students help our classes start the day on a positive and mindful :) note. Mindful Thoughts Journal questions are also great conversation starters during our morning meetings. We like to provide the students with the opportunity to share what they wrote or drew with each other or with the class and to discuss what they discovered/learned while working in their journals. It can be fun to see how the students interpret the daily doodles. For example, some students may have a different take on “apples”. They may draw an apple tree, barrel of apples, apple pie, applesauce… The daily doodles provide students with the opportunity to stretch themselves and think outside the box. We created the Directions spread to be editable allowing you to adjust the instructions for your classroom. Please note that the editable version is a PowerPoint file. You will need access to a program that can open and edit that file type. The Mindful Thoughts Journals were created to be printed back to back and bound in a three-ring binder, a spiral-like binding, or with staples. The binding system that we love is the Swingline ProClip Binding System. They’re fast, cheap, easy to use, and they look great! We have provided five weekly spreads realizing that you may not need all five depending on how the days in the month fall and your school’s calendar. Feel free to remove any pages that are not needed. There is a small glossary on the Directions spread to help the students complete their Mindful Thoughts Journals independently. We have created the Directions spread as editable allowing you to tweak the directions to best fit your classroom and students. Here students will write a few things that they currently enjoy doing. These things will likely change from month to month. The Currently page is a fun keepsake to look back at throughout the year to see how students' likes and dislikes change as they grow. Here students will write the titles of books that they have read during the month. Students will enjoy tracking their books on this fun themed page. Here students will keep track of how they feel each day. They will color in today’s number with the color that represents how they feel today or felt yesterday depending on when you have your students complete their journals. We recommend having your students work on their Mindful Thoughts Journals in the morning as they are beginning their day and complete the mood tracker for the day before. Keeping track of how your students feel will help them to better understand their emotions, how those emotions are triggered, and how their emotions can influence their day. Gratitude is about focusing on the good things in our lives and being thankful for what we have. Here students will write one thing that they are grateful for each day. According to Harvard Health Publishing, studies have shown that the practice of expressing gratitude each day "is strongly and consistently associated with greater happiness. Gratitude helps people feel more positive emotions, relish good experiences, improve their health, deal with adversity, and build strong relationships." 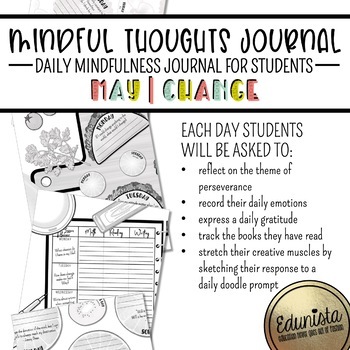 In a world where everyone from our students to our teachers and administration are feeling stress, teaching self-care practices with mindfulness activities for students like gratitude journals are not only encouraged but essential. Each two-page spread is designed and laid out a little differently but they all have some of the same pieces. Each spread will have a spot to write and draw each day. We recommend that the students write their answers in complete sentences and expand on their writing. For example, they can explain why. Remember these questions are just to get the students started thinking. Each day also has a doodle section. This section is meant to be a quick drawing for students to practice their sketching skills, and creative skills and practice expressing themselves. Some spreads have extra doodle sections. We like to have our students complete those sections when they have extra time after they have completed their other work. When the journal is complete, students can think back on the work they’ve done focusing on the theme for this month and develop an action plan for the future. Want to save money? Get the Mindful Thoughts Journal Growing Bundle! What is a growing bundle? A growing bundle is a bundle that is not yet complete. The Mindful Thoughts Journal Growing Bundle will not be completed until July 2019. We've added the option to buy the bundle so you can have access to the Mindful Thoughts Journals as they are completed. The individual Mindful Thoughts Journals are sold for $8 each. Buying the bundle saves you over 30%! Plus, the earlier you purchase this growing bundle the more you save! The price of the bundle will continue to increase each time another journal is added until the bundle is complete.